Sweet, creamy caramel mixed with Deep Rich® dark roast coffee and a pinch of salt combines to excite your taste buds in this delicious, slightly indulgent cappuccino. Each 2 lb. bag of Salted Caramel Cappuccino Mix makes about 22 - 8 oz. servings. INGREDIENTS: SUGAR, NON DAIRY CREAMER (CORN SYRUP SOLIDS, PALM OIL, MONO-AND DIGLYCERIDES, DIPOTASSIUM PHOSPHATE, SODIUM CASEINATE (A MILK DERIVATIVE), CONTAINS LESS THAN 2% OF SILICON DIOXIDE, ARTIFICIAL COLORS, SODIUM STEROYL LACTYLATE, NATURAL AND ARTIFICIAL FLAVORS. 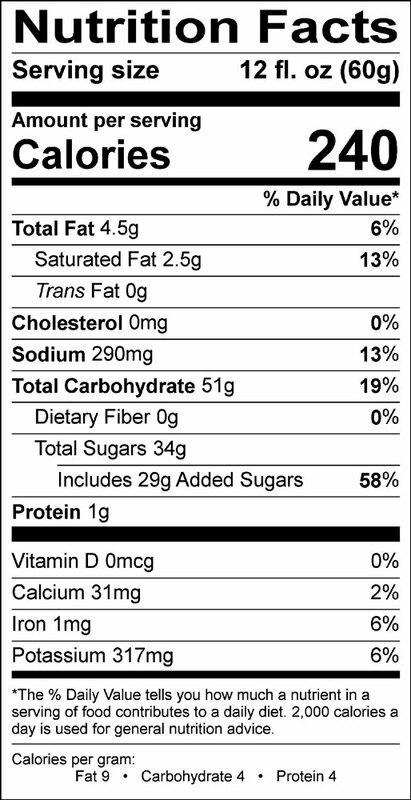 ), CORN SYRUP SOLIDS, WHEY, CONTAINS LESS THAN 2% OF ARTIFICIAL FLAVOR, CELLULOSE GUM, COCOA PROCESSED WITH ALKALI, INSTANT COFFEE, NATURAL AND ARTIFICIAL FLAVOR, SALT, SILICON DIOXIDE, XANTHAN GUM. • For a creamier cappuccino, use hot milk instead of water. I use 2 scoops in 8 oz cup, taste great. Over ed it, and was delivered very quickly. Needless to say I've had the 2lb bag for about week now and it's almost gone. It's something you can't get tired of. I don't have any kind of machine I just use 2-3 spoonfuls mix with hot water, and enjoy. Definitely love this product and would refer it to anyone! Great flavor and definitely a treat to my senses. This is absolutely wonderful. I will be ordering this again! Great product we love it.